Polymer Photogravure: A Step-by-Step Manual Highlighting Artists and Their Creative Practice is a three-part book on the non-toxic process of making ink-on-paper intaglio prints from continuous-tone photographs using water-etched photopolymer plates. Author Clay Harmon provides clear and easy to understand instructions that will enable anyone to successfully make a photogravure print. By quantifying the sensitometric behavior of polymer plates, Harmon has developed a methodical approach which will enable a new printmaker to produce plates in their own studio with a minimum of time and wasted materials. Section One provides a straightforward guide to setting up the polymer photogravure studio. Section Two covers a step-by-step method of making the print from start to finish. Section Three showcases contemporary artists’ works, illustrating the variety and artistic breadth of contemporary polymer intaglio printmaking. The works in these pages range from monochrome to full color, and represent a variety of genres, including still lifes, portraits, nudes, landscapes, urban-scapes and more. Featuring over 30 artists and 200 full-color images, Polymer Photogravure is a most comprehensive overview of this printmaking process in print. Polymer photogravure plates enable an artist to use an almost-infinite range of image color and papers to make a print. The finished prints are extremely archival, consisting of only ink and paper. With Harmon’s instructions, continuous tone intaglio prints are within the reach of all. Harmon's book is the most comprehensive book to date on photopolymer gravure, delivering a wealth of information in an easygoing, clear manner. The work and essays by current practitioners is a real bonus. 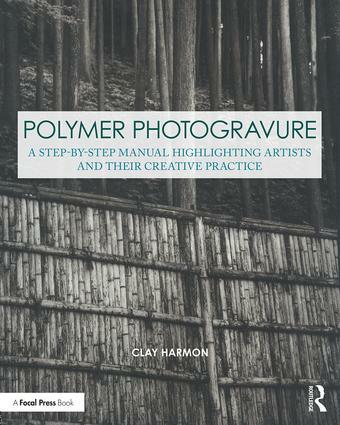 This book is a must-read for those already practicing photopolymer gravure and those new to the process. Clay Harmon’s photographic work combines contemporary subject matter with historic photographic techniques. His interest is in the push/pull between the beautiful and the ugly often found in the urban landscape. Harmon’s work has shown nationally and internationally in over thirty shows and ten publications. He teaches workshops nationally in polymer photogravure and other historic photographic printing processes. To see his work, visit clayharmon.com. The Contemporary Practices in Alternative Process Photography series focuses the lens on a variety of alternative, historical processes from the medium’s 180-year history. Each book outlines a step-by-step approach to a particular medium, and features contemporary artists who use that particular process regularly in their practice. The richly illustrated books in this series serve as guidebooks for those new to alternative processes, refresher courses for professionals already familiar with each medium, and a source of inspiration for all.